Zurich Airport can be accessed with different modes. Even by bike you can reach the airport on a safe cycle track. Furtheron, the airport offers various facilitites for intermodal passenger convenience. 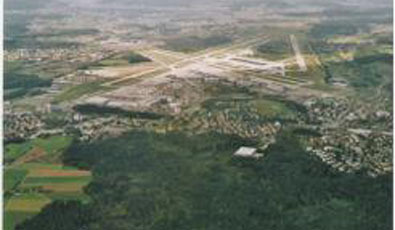 Zurich Airport is located in Kloten, canton of Zurich, Switzerland and is managed by Unique Airport. It is Switzerland's largest international flight gateway and hub for Swiss International Air Lines and Lufthansa. In 2006 19.2 million passengers and 260.000 air craft landings and departures were counted. In 2003, Zurich International completed a major expansion project in which a new parking garage and a new midfield terminal were built, and an automated underground train to move passengers between the existing terminal complex and the new terminal was launched. Zurich airport railway station (Zurich Flughafen) is located underneath the terminal and was inaugurated in 1980. Frequent S-Bahn services plus Inter-regio and intercity services to Bern, Basel, Chur, Genf, Lausanne, Luzern, Konstanz, St. Gallen and Zug are provided every 30 minutes, Lugano, Zermatt or St. Moritz every hour. The terminal building of Zurich Airport consists of two complexes. The main complex homes all airport related facilities, gate A and gate B. The second complex, which is the new one, homes gate E. The main complex was erected in several levels. At lowest level (-3) the platforms of the train station are located. One level higher(-2) the train station facilities are situated. A ticket counter, luggage check-in and a desk for train and for aircraft can be found there as well as shops, gastronomy and service providers which are accessible for all persons. The next level (-1) homes a broad variety of shops, gastronomy and service providers (bank, post office). At-grade level the major check in desks and links to gates A and B are situated. Here can also plenty of shops, gastronomy and service providers be found. The bus terminal is located at-grade level of this building, too. Car parks are at-grade as well as on levels above. The second complex of the terminal building of Zurich Airport consists of four levels. The lowest level homes the station for the underground train that links the two complexes. One level higher the security checks are established. The upper two levels are passenger areas only and home gate E. The main modes for long distance travel (aircraft and train) are accessible in one building by foot within a maximum of ten minutes walk. Barrier free accessibility is guaranteed and special services for people with limited mobility are offered. All the areas are weather protected and have plenty of waiting areas.>The airport is very well embedded into the local and national railway network. Within 9 minutes in intervals of 10 minutes the main station of Zurich can be reached. From there nearly every 30 minutes trains are leaving to every major city of Switzerland. The Swiss Federal Railway (SBB) offers excellent luggage services. In more than 50 train stations luggage can be checked in on the previous flight day. This is valid for all major charter airlines. For arriving passengers heading for any destination in Switzerland luggage will be brought to every single train station in Switzerland automatically (by check-in at any airport worldwide). For the areas around Tessin and Bern a door to door service for luggage is provided (This is just a test and it is not yet sure if this will be implemented in whole switzerland). Leaving from or going to these areas can be managed without carrying any luggage. A very unique way to approach Zurich airport is to go by bicycle. A cycle path from the city to the airport provides comfortable cycling conditions. For passengers approaching Zurich airport by private car more than 10.000 parking spaces are available. The car parks are directly situated around the airport terminal. A special parking space for long time parking is provided, which is located outside of the area and connected to the terminal by bus.On the airport area plenty of different service locations are situated e.g. a conference centre, lounges, VIP-services, rescue service, nursery, dayrooms. In the public area 60 different stores and restaurants are located and another 50 more are situated after the passport control. Different waiting areas like lounges and normal waiting areas for departure and arrivals are provided and well secured. Police and private security companies are responsible for the security around the whole terminal buildings.Very clear maps of the project area are distributed around the terminal. They provide a very good overview of the airport as well as of the surrounding area and help to find your way to certain places and services. Real time information for arrival and departure flights is available at the terminal and via internet. Train information is available on internet and at the airport real time only at the airport. Information about free capacity of car parks is also available via internet.